There’s more to Oxo than gravy granules and chicken stock….. 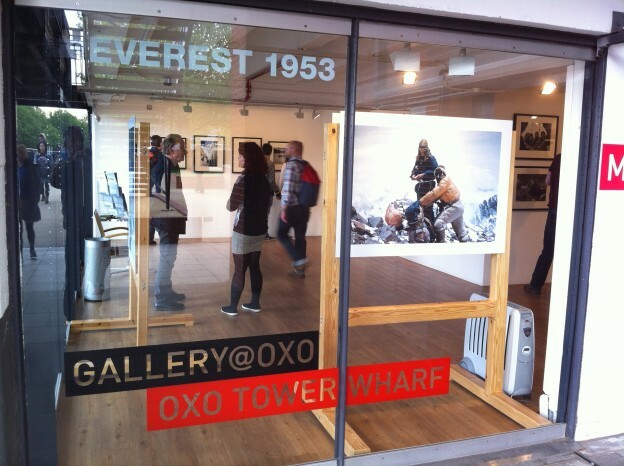 The Oxo Tower on London’s South Bank is hosting an amazing exhibition of prints of original photos taken on Sir Edmund Hillary and Tenzing Norgay’s first successful summit of Mount Everest 60 years ago. The exhibition is being staged by the Royal Geographical Society as part of its celebration of the 1953 expedition. The 47 images convey the beauty of the Nepalese Himalayas. Although only 60 years ago, the Hillary expedition was pre-gadget and gizmo climbing. With what looks like cotton tents and woollen clothing, equipment for Hillary and his team looks very basic compared to today’s standards. You realise that behind the iconic images of Hillary and Tenzing’s ascent was a large team of climbers, without whom the successful expedition would never have happened. You also see images of the earlier 1951 expedition which served as a dress rehearsal for the big one two years later. The exhibition is free, though buying one of the prints come at a price. They range from £380 through to £700, and then there is VAT on top. 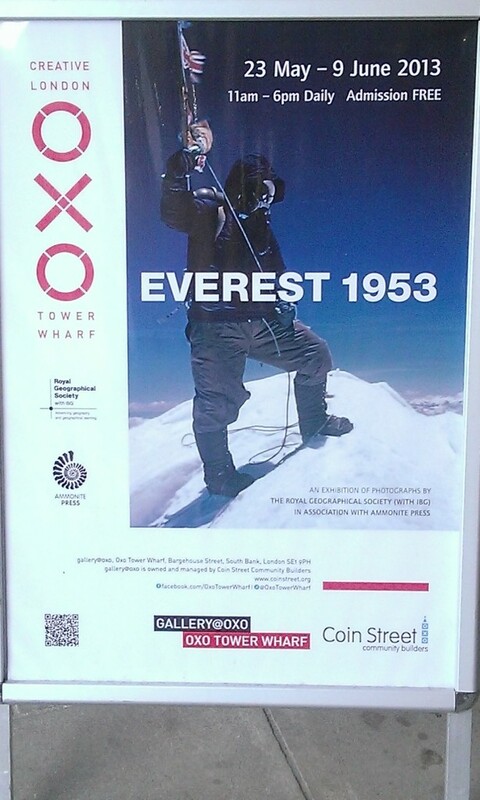 But for many climbing enthusiasts these prices are well worth paying, as it’s their chance to buy a part of history.The exhibition is part of the wider celebration of the 1953 ascent, news of which reached London just a day before the coronation of the Queen in 1953. To mark the event the Queen met the sons of Edmund Hillary and Tenzing Norgay in London this week. Their fathers’ achievements are still feted as one of the most remarkable achievements in the twentieth century. Yet sixty years on questions are being raised why it was only Hillary who was knighted. The campaign for a posthumous knighthood for Tenzing Norgay gathers momentum to address this injustice. Everest 1953. Thursday 23 May- Sunday 9 June 2013, 11.00 am – 6.00pm (also open at weekends) The Oxo Gallery, Oxo Tower Wharf, Barge House Street, Southwark, SE1 9PH. Tickets; entry is free.